Piso Fare Promo 2018: Here's a current update for the country's low cost airline, Cebu Pacific as it increases its flight frequencies to three international routes. Certainly, expect promo fares to be offered to these Asian cities. The airline plans to boost its frequencies of flights to Indonesia, Japan and Vietnam. Because, the holiday season is definitely just around the corner and it is said to culminate from the 4th quarter of 2017 until the 1st quarter of 2018. This is a perfect holiday treat for passengers who might plan to visit these country to spend their Christmas vacation. From the current five times weekly (Sun/Tue/Wed/Thurs/Sat), CEB will fly six times a week (Sun/Tue/Wed/Thurs/Fri/Sat) between Manila and Osaka, Japan starting November 3, 2017 until December 06, 2017. The Manila-Osaka route will increase further to daily operations by December 15, 2017 to March 2018, in time for the Christmas season. For the Manila-Nagoya route, CEB will fly six times a week (Sun/Mon/Tue/Thu/Fri/Sat), up from the current four times weekly (Sun/Tue/Thu/Sat), starting October 29, 2017. For Tokyo (Narita), on the other hand, CEB will boost frequency by 100%, from the current seven times a week, to 14 times weekly, starting October 29, 2017 until March 24, 2018. 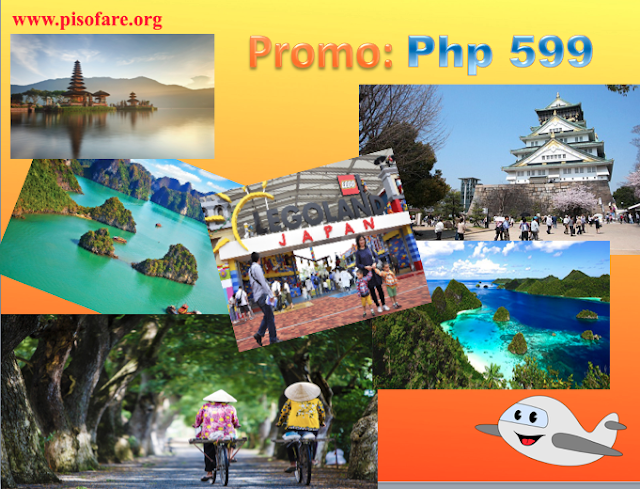 However, if you're looking for some domestic promos now,the cheapest you can get is Php 599 all-in, one way fare going to Boracay (via Caticlan or kalibo) and Dumaguete. Of course, a lot of of cheaper fares are on set below. Sorry, there is no Piso Fare promo as of this time yet. Maybe let's hope for one offering as the Christmas season is already very near! Here's more to added flights to Indonesia from its four times a week. Cebu Pacific will also increase flights to and from Bali (Denpasar), Indonesia. It's expected the flights will be five times weekly starting December 04, 2017 until March 06, 2018. From five times weekly, CEB will increase flights between Manila and Hanoi, Vietnam to daily, or seven times a week, from December 1, 2017 to January 9, 2018.